The burrowing lizards are also known as tegus always need the best substrates to serve their purposes. Substrates which also mean beddings provide comfort to the pet and making their stay in the new environment better. It is aimed at ensuring that the pet remains healthy and that it is able to carry out all the activities that it can carry out in a natural ecosystem. Since tegus keep on burrowing themselves, it means that they require a substrate that can help them burrow for up to 60 cm. 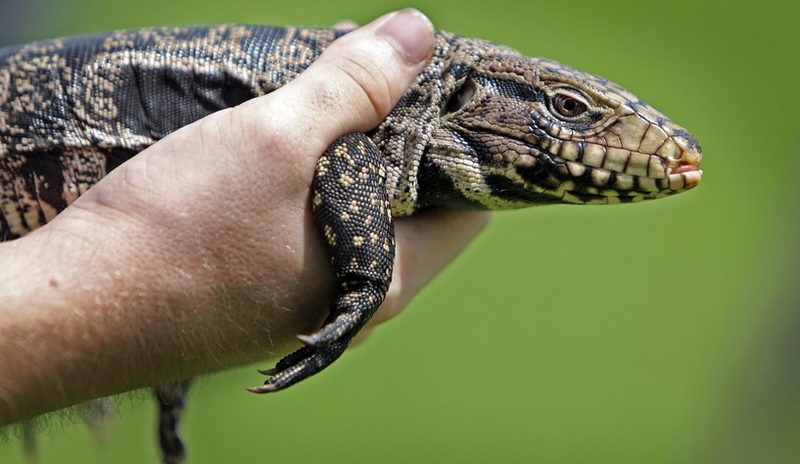 providing tegus with a place where they can burrow themselves means physical fitness and makes them more natural. Burrowing also allows the tegu claws to remain filed without being interfered with by the humans. These are self-cleaning substrates that help the tegus to remain healthy and comfortable. The bedding can be used for a very long time without being cleaned which allows the tegu to have the longest chance of life possible to carry out all its activities. The maintenance cost us therefore low than the other substrates which make it one of the best tegu substrate in the market. This materials making up this bedding allow easy burrowing of the tegus making it as similar to the natural environment as possible. Additionally, it does not irritate the sensitive feed off the young tegus making it easy to grow the young ones. 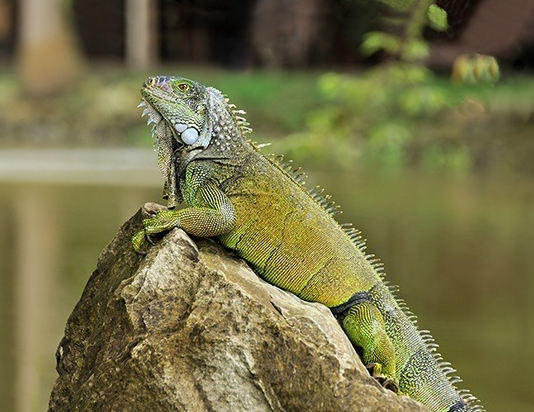 Due to its bioactive properties, even the most sensitive of the reptiles can be reared on it without being disturbed. Bearded dragons have been a favored house pet by many pet owners for quite a number of reasons. These docile pets are not only quite tamed, but they are also easy to look after. Once they have settled in their new habitat, you only need to do a few things to maintain their health. If they are provided with adequate and proper nutrition, provided the right level of heat and humidity, as well as cleaned regularly, they may stay with you for the next 10 or more years. That does not mean that they are free from any sickness that may cause their health to deteriorate. Like any other animals, they are also susceptible to disease-causing microorganisms widely distributed in the environment. One of the diseases that most bearded dragons fear is called Yellow Fungus. It is colloquially known among hobbyists as the Yellow Skin Disease. This fungal infection can cause severe skin infections or fungal dermatitis. If not treated properly, the condition can be fatal to a birdie. Such a skin condition has been proven to be lethal to other reptile species as well. This skin condition is clinically known as Chrysosporium anamorph of Nannizziopsis vriesii or CANV. It is a skin condition that is caused by aggressive flesh-eating fungi. The fungi attack both the superficial and deep layers of the skin. The infection will first appear as yellow, brown or grayish patches on the surface of the scales. It is normally seen as a small spot that gets bigger in time. More spots may appear on other parts of the body as time passes by. As the disease progresses, the color of the patches will become dark. It will also be cracked or crusty. The discoloration of the skin is accompanied by the formation of necrotic lesions. This formation will eventually scrape the outer layer of the skin and reveal sensitive ulcerated tissues underneath the scales. It can also spread painful swelling and inflammation under the skin. In more severe cases, hyphae of the fungus (main mode of vegetative growth of the fungus), can extend deeper into the body cavities and internal organs of the reptile. This often causes marked pathology and the eventual death of the beardie. Bearded dragons are quite active during the day if they are healthy. However, if they are infected with the Yellow Fungus, they may be quite restless.You may also observe them to lose some weight, have a poor appetite, have sunken eyes, shed irregularly. When they shed, what is left behind are dull or discolored scales with a rough appearance. They may also have wounds that have discolored scales around them. These wounds may also be swollen badly, with a discrete puss, and with a foul smell. 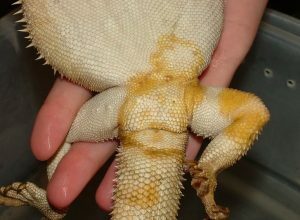 A bearded dragon that is sheds constantly but does not gain any weight can be manifesting early signs of yellow fungus. 1. Dirty enclosures. Bearded dragons may be exposed to elements within the enclosure that are already contaminated. Choose the Bearded Dragon enclosure.